Your learning adventure starts here! There is no other second tier city quite like Geelong in Australia in terms of making the most of our opportunities. Our rich history can be told through the amazing architecture that you will see throughout the city as we were founded on the gold and wool booms of the 18th Century. Nowdays Geelong has transformed into a smart city based on education, health and research. We call Australia 'The Lucky Country' and there is no where that expresses this more than Geelong. Geelong is truly is an education city with a wide range of education providers and study pathways. When you move here you will be well looked after by the institution you enrol with and be welcomed into our community. We want you to make the most of the opportunities available, have a sense of belonging and try new experiences. If you prefer a coastal outlook, then head to The Bellarine. If you are into arts, you can soak up the heritage via Australian artists at the Geelong Art Gallery or learn why sheep were so important for the economy of the city at The National Wool Museum. There’s enough to explore in Geelong itself with its stunning Waterfront, whimsical bollards, landscaped botanic gardens and a variety of amazing experiences. 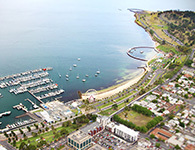 But due to its convenient location near the bush and the beach, Geelong is the gateway to many more adventures.